I am almost at the end of this leg of the EAT MY GLOBE trip and to be perfectly honest, I am running on empty at this point. Admittedly, the fumes I am bumping along on are filled with the pleasing scent of all the BBQ, Hot Dogs, Tacos, Po’ Boys and Philly Cheese Steaks I have consumed in the last two months, but fumes never the less and the last few days of the trip are proving quite tough. So what better, when one is tired, than to be welcomed into the bosom of a family for that most American of celebrations, Thanksgiving? This was not my first experience of a Thanksgiving meal but it was the first time, in all my many visits to the USA, that I had found myself in the country on the day itself. 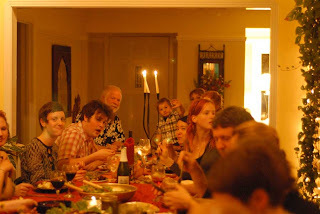 This, however, was no ordinary Thanksgiving nor, indeed, was I going to be joining an ordinary family. When I first floated the notion of heading off around the world to stuff myself silly, the very first invitation I received was from my new chum, Tana Butler, to join her and her extended circle of friends and family in Santa Cruz, the weirdest of Californian cities. Dinner was to take place in her friend, Laura’s house that evening. But, first I found myself at Tana’s place helping to lug around a 25lb turkey ( yes, I said 25 lbs) and preparing her other contributions to the night’s meal, devilled eggs, dressing and shitake gravy. We cooked, we talked, we played with Tana's little grandson, Logan and we listened to Louis Prima. I did quite a bit of drinking too, both of the incredibly view from her back yard and from a bottle or two of quite decent pinot. It was all incredibly restorative and by the time the bird was cooked, I was ready for the full blowout. First of course, the best bit of the whole turkey, the giblets which Tana’s husband, Bob and I shared before we drove over in a car over burdened with Thanksgiving delights. We were greeted by nearly thirty people all of whom had brought their own contributions to the meal. Cranberry sauce, creamy mashed potatoes, stuffed squash and enough other things to feed about double the number of people who would be sitting down to share this meal. As I said, this “family” was no ordinary family with ex wives sitting down with ex husbands, half sisters sitting down with step sisters of third marriages etc etc. All very confusing, but all incredibly welcoming to the latest stray to turn up for a meal. That’ll be me then. It was noisy, raucous and all enormous fun. Guitars appeared, people sang and I returned to the heaving buffet enough times that I have spent the whole night dreaming of high strength Zantac. Right now, I am just giving thanks for a memorable day and for the fact my stomach did not explode. Dearest Simon, after the meal you served tonight, and the love you have sewn in our little family—well, I hate Spain because they will get you and we shan't. Wow, he taught you to speak Welsh?? Simon, you've been holding out on me. What a lovely time you all had! I'm happy for you. He is a fun Thanksgiving guest, isn't he, Tana?